The site is on an undulating, north facing, glacial terrace that overlays a deep sedimentary papa base. There are two very distinct soil types within the vineyard. The higher terrace is a loessial clay loam which overlays a layer of shingle about 1.6 meters below the surface. The lower flatter terrace is a deep stony loam. In the main the Sauvignon Blanc is planted on the lighter soils and the Pinot Noir on the tighter denser northern aspect clay loam. The Pinot Noir was planted straight into existing undisturbed soil and the Sauvignon Blanc site was deep ripped to minimise the stress on the posts when driving them in to the ground. 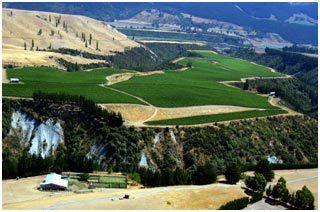 Ballochdale Estate Vineyard rises up to over 300 meters above sea level and has approximately 55 meters of fall across the site and then on the edges on three sides falls off into these very deep gorges. Before planting we lit a lot of little fires to observe the air flow movements on cold mornings and it became very clear that there was a very consistent southerly drift of air draining off down into the gorges. It is the combination of altitude which gives induces a high diurnal temperature range, sheltered location, the isolation, the northerly aspect, the evenness of and suitability of soils and the inland climate which all combine to give the ability to produce wines of identity and intensity. This all aids in minimizing frost risk to which Pinot Noir can be vulnerable in the early spring due to it being an early shooting variety. All but one block have the rows running in a north / south direction with 2.2 meter row spacing. The fruiting wire is at varying heights and all vines are grafted onto a variety of rootstocks. The vineyard has constantly produced clean fruit over the year and this was highlighted in the two recent difficult vintages when the vineyard performed admirably. This is all aided by the inland situation, isolation and altitude of the site. There are five different clones (4 French plus UDC 5) of Pinot Noir and a single clone of Sauvignon Blanc on different rootstocks. The Pinot Noir vines are spaced 1.44 meters apart and the Sauvignon Blanc 1.8m apart. Target production in is the order of 130 Tonnes of Pinot Noir and 100 tonnes of Sauvignon Blanc per year. After the 12 years the vines are well settled down now and nicely in balance. Most of the Pinot Noir is spur pruned and well set up for target yields. Text book stuff as a recent viticulturist commented recently. The target production has increased over the years with the maturing of the vines and the change in the demand for the fruit supply. The has been more of a focus on volume but there is the opportunity to produce very high quality fruit when specific blocks are targeted for such end use enhancing the versatility of the vineyard. Over recent years the crop has been in the order of 160 tonnes of Pinot Noir and 130 tonnes of Sauvignon Blanc. This is aside from the Trust Block nearby. Vintage 2018 allowed us to go above target yields and the vineyard ended up picking 194 tonnes of Pinot Noir and 130 tonnes of Sauvignon Blanc giving solid per hectare returns and happy customers at the same time.